For this October’s issue, Tobias Schaaf makes us all nostalgic in part 1 of his Game Nostalgia series. @Kamots shows us his ODROID-GO wireless charging mod, which is perfect as our Coding Camp guide this month describes reading the ODROID-GO’s battery voltage. 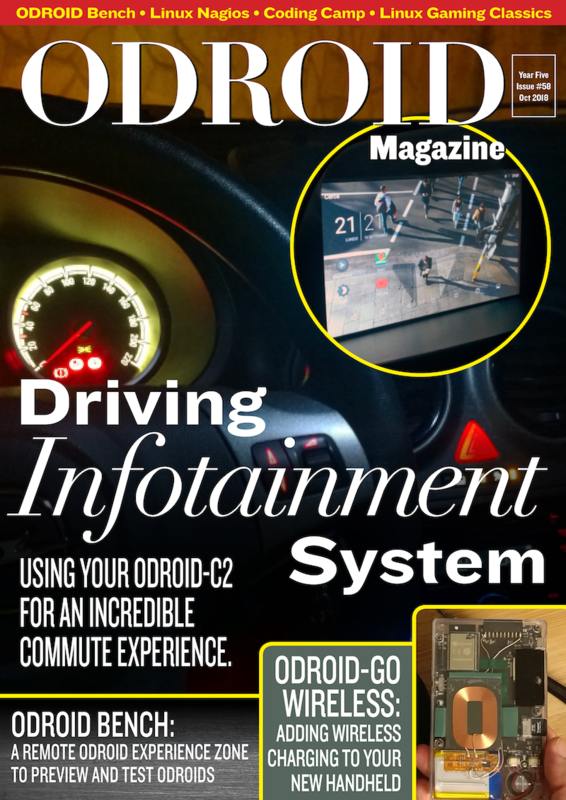 @poptmartone takes his ODROID-C2 on the road running Android Auto, as he shows off his astounding car infotainment unit mod. In part 5 of Erik Koenneke’s BASH Basics series, he teaches us about ‘if statements’, ‘inputs’, and ‘functions’. Dongjin Kim shows as a new testing tool for all ODROIDians to use, a cloud-based ODROID testing platform called ODROID bench. Lastly, we meet another ODROIDian in this issue, David Knight, an optometrist from Newcastle, UK. Last edited by robroy on Wed Oct 10, 2018 11:04 am, edited 1 time in total. Surprised to see my infotainment system, many thanks, I'm honoured. poptmartone wrote: Surprised to see my infotainment system, many thanks, I'm honoured. You were contacted by Rob?